💰Use the Money Reiki Mp3 to Tune In and Activate 😁ABUNDANCE! - Wealth ~ Abundance ~ Joy NOW! It's so easy to find evidence for a lack of abundance and lack of wealth. Our mindsets are programmed by the world around us, negative people, the media, lack minded family members, to view our experiences and our world from the perspective of "lack of abundance". That sense that something is missing. When we look at one thing through the eyes of lack of abundance, it carries over to everything we look at and experience. And even though we might be surrounded with oodles of abundance around us, we can't see it. We only see where it's missing. Ouch! What if I told you that nothing is missing, you only can't see it? What if I told you you are so deeply conditioned to notice what isn't working, what isn't here, what isn't flowing that you can't begin to see and appreciate what is? So you trip over the abundance, stub your toe and say "ouch" never noticing what you just tripped over! And you continue on your not-so-merry way of noticing what you lack. What if you woke up to see that NOTHING is wrong with you or missing at all. It's ALL here and has always been here, you just can't see it. What you can't see, you can't have and use and appreciate. You don't need to "fix" your abundance or you. But you do need to shift and adjust your mindset. Just like tuning into a different radio station because you can't stand what is playing on the one you are on, you change the tuning of your mindset. If you are tuned to a radio station that is playing dreadful music and you find yourself continually upset by the sound, what do you do? Do you notice how awful it is and complain endlessly? Do you call the station and shout at the DJ? Or do you just simply change the channel to another station that is playing what you WANT to hear? It's the same with abundance and mindset. If you are noticing how awful the 'music' (your life experience) is ... do you complain endlessly? Shout at and blame the circumstances? Do you try to fix it? (try nagging the DJ at the radio station) Or do you change the channel in your mind and focus on something pleasing, looking for the abundance to re-tune how you feel? Your feelings are the vibrations you emanate into the world which connects you with like vibrations. FEEL abundant, SEE abundance, RECEIVE abundance. Stay tuned to this new "abundance radio station" and you will start to see the abundance everywhere! ▶For support in changing the tuning of your mindset and feelings (your vibration!) 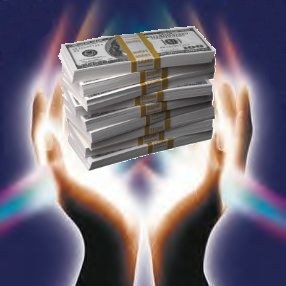 go download this FREE Money Reiki Healing mp3. It's a powerful energy healing channeled into an mp3, the energy is transmitted to you as you listen. You'll enjoy the yummy energy and you'll become more aware of the abundance and feel much more optimistic! Use it often! ▶When you are ready to live in FUNbundance (joyful FUN and abundance) follow the rainbows and unicorns on this page!